Greece.Mykonos and Tinos. Fri 22 to Sat 28 Sept.
7 of us flew into the Greek Island of Mykonos on Friday 22 September. Myself (Edwin) Phil and Mary, Ernie and Nicola and Peter Wilson and Richard Boulton from Arun Adur Section. The flight went well leaving behind a rainy Gatwick for the blue skies of Greece. A lot of the group had bikes in boxes to be stored at the first nights hotel so we decided to all get taxis. After some shaking of heads by some local taxi drivers the bikes were accommodated sticking out of the open boots with many of their long bungie cords. Our hotel was in the central part of town within a large area of narrow alleys with no cars allowed. We had a small pool to relax by in the warm sunshine after building up the bikes. nil miles for the day by bike. Overnight heavy thunderous rain moved through. The hotel staff were very thoughtful moving the bikes to cover or putting covers over them. The rain cleared soon after breakfast to warm sunny skies the rest of the day. We decided on a short shakedown ride to the edge of down before catching the 13.15 car ferry to Tinos. One bit shookdown more than anticipated as my brand new chain broke. Sorting it out could meant missing the ferry so I walked scooted or freewheeled the one and a half miles back to the ferry. We arrived in good time and were directed to the right ferry as 3 big car ferries arrived at near enough the same time and manoeuvred for position to berth on the short jetty. 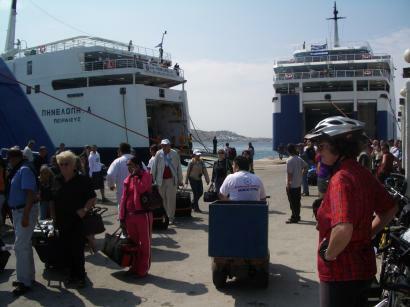 Obviously rush hour time for ferries at Mykonos. The crossing was 35 minutes with the towering hills of Tinos Island visible from Mykonos. After disembarking I used a chain tool to shorten the chain by 2 links and rejoined it. Then a Tour round town to find a hotel but little room at the inns due to it being Saturday and many Athenians being over here for the weekend. We were eventually sorted with 4 in one hotel and 3 in a nearby hotel. Tinos is known as Greece's Holy Island and is home to an Icon housed in a church up a hill on the edge of town. Many Greeks make a pilgrimage there and some of the ladies crawl up the hill on hands and knees. Some were doing this as we walked to visit the Church in the evening. Carpet is laid at the side of the road to help them. 4.2 miles for the day. I rode at a brisk pace via West Stoke and Funtington to stop for elevenses at Compton. There were a lot of Charity riders on the route with a lot of signs up for 4 routes from 15 to 40 miles. I continued over the hill to Harting and then Rogate and Milland reached at 11.55. Colin and then Steve joined me. The return route took in some great quiet lanes via Woolbeeding across to Midhurst and then Selham and Graffam. At the base of Duncton Steve headed further east via Fittleworth to get a train back from Pulborough. Colin and I climbed Duncton to head back towards the coast. 61 miles for the day. Sunday 10 September. Cafe to Cafe Ride. We took a route through the Roman Palace to the A259 and then Old Park Road to the path alongside Bosham Harbour which was still wet from the earlier high spring tide. We had coffee at the Harbour Cafe where Adrian and Val joined us.Cath then left us as we made our way to the A259 and took Newalls Lane over the Railway to West Ashling Road. Then via Woodmancote, Westbourne,Aldsworth and then a bridleway at Stubblemere to Woodberry lane to Rowlands Castle for lunch. It was very busy with dozens of cyclists including a Road Race, Charity Ride from Aldershot and a Tour Group of elderly (70s) Americans on Dutch bikes. Adrian left us at Rowlands Castle and after lunch we retraced our route to Stansted House and took bridleways through to Racton and then West Ashling and Fishbourne Roman Palace for tea where Cath was waiting for us. Weather was clear sunny and warm and mileage was 32. Sunday 10th September. Cafe to Cafe Ride. Indian summer conditions of hot sunshine and clear skies. around a large round table in the cafe. was a quick ride along more lanes to Rowlands Castle. 7 people met at Chichester Library including myself (Alan) Liz, Julian, Bruno, Cath, Christine and Val. We took the Salterns Way path through Appledram and the route through to Chichester Yacht Basin. We then picked up the the Salterns Way route to Itchenor Caravan Park turning left on the Birdham Road the short distance to Russell's Garden Centre for tea. After refreshments we took the direct route through Birdham to the Yacht Basin and then back the same way to Chichester City Centre. The weather was bright and sunny with an easterly breeze with high cloud moving in late on. Weather was warm and dry today but cloudy with some mist. 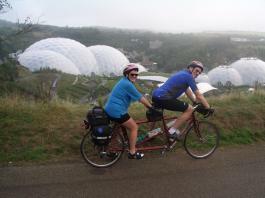 We rode about 6 miles to the Eden Project and spent the morning exploring the Domes. The visit was well worth the ride and we claimed a 3 pounds discount for arriving by bike. Lunch was taken in nearby St Austell and then some welcome rest with a long train journey back home. Sunday 10 September. Ride to the Eden Project. Steps Bridge to Golant. Today was to be a shorter ride than the previous 2 but with a lot of climbing. Weather was warm and sunny in the morning and humid with cloud and mist in the afternoon. Temperatures reached 24C. Steps Bridge is self catering but Mary did us proud for breakfast with pannier supplies of porridge and pancake mix with golden syrup and other toppings. We needed the good start with a long climb from the Hostel to a ridge. Then a steep descent to Mortonhampsted and then another long climb with many ups and downs to the top of Dartmoor at 1500ft. One hazard was sheep lying at the side of the road which would suddenly decide to get up as we approached. To Torpoint and lunch there. We continued across to Looe and a stop for tea and then backroads to Fowey and another chain ferry. Soon afterwards Colin left us to ride on to St Austell to catch a train to Bath from where he plans to ride home from tomorrow. We rode on to Golant YHA which is about 6 miles from the Eden Project which we visit tomorrow. 66 miles for the day. Saturday 9 September. Swanage to Steps Bridge. Today we continued our ride towards the Eden Project with a ride from Swanage to Steps Bridge on the eastern side of Dartmoor. Weather was again sunny all day with a great 20mph easterly tailwind again. Temperatures reached about 23C. We had an early 7.40 start thanks to the Youth Hostel agreeing to supply us an early cold breakfast. We headed north towards Wareham and then turned off on a quiet byroad part of the South Coast Cycle Route. We stopped at Moreton where Laurence of Arabia is buried to look at a Church with unique etched engravings on the windows. We continued on back roads to Dorchester and stopped for elevenses at Tchibo in the High Street. Then on and westward taking a back road gradually climbing Eggerton Hill and a sharp descent to the north of Bridport and lanes west. 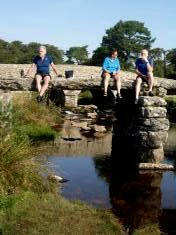 We climbed a steep ridge to the East of Axminster and stopped for lunch at a Pub at the top. After a few miles we crossed the border into Devon and down to Axminster. 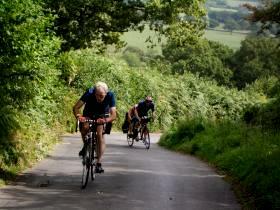 We had to take the busy A35 for a few miles to Honiton with many climbs. 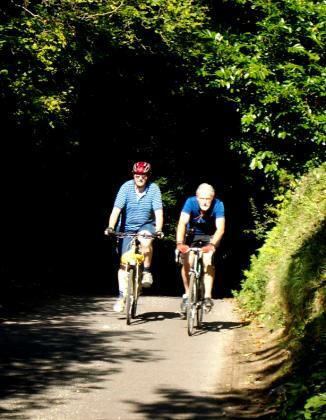 Then a signed cycle route on the old road to Exeter. Friday 8 September. Ride to Eden Project. Chichester to Swanage. ( Edwin) Phil and Mary and Colin. The plan is to ride down to the Eden Project over 3 days and then Monday look round the Eden Project and train back. Weather was perfect with clear blue skies all day and a strong easterly tail wind and temperatures up 21C. We had a good early start at 7.30 and rode via Clanfied and Exton which we reached at 9.00am. Elevenses was at Bishops Waltham. On the flat B road to Fishers Pond we reached a steady 20 mph. Then on via Ampfield and Romsey to stop for lunch at Carlos's Tearooms near Wellow.